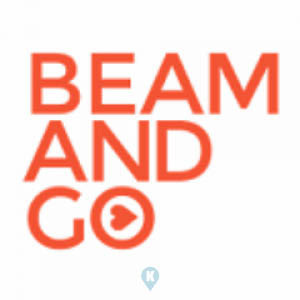 BeamAndGo has been around a bit when I was introduced to a new way of shopping convenience. For me it is a way of buying gift cheques or gift certificates for 1) easy purchase 2) gift giving and 3) for OFW, an alternative to sending cash as remittance. Personally I tried it and it was all easy as 1 2 3 for me. Read on the steps and my reaction at the end of this article. Step 1: Sign up is free and easy, simply click on the following picture and it will take you there. Type MR98288 so you can registered for free. 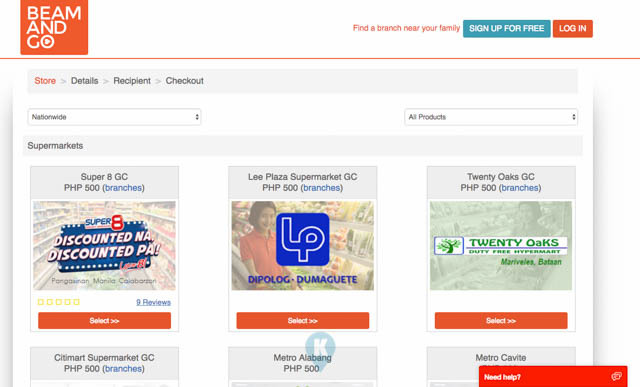 Check already herein which establishments are near you and that you can purchase from. As you scroll down, most likely you'll see one that is accessible to you. They have covered the whole Philippines as per my scrolling. Mine it was Super 8 that alone has lots of branches. Select that establishment. Step 2: Choose how many GC you will purchase. Usually GC are in denominations of Php500. For the Discount Code, this is our tip. On the lower right corner, there is a Need Help Button. Its their 24 hour Live Chat to help you out when you have questions that need immediate attention. Click on that and wait for live chat person. Ask for a Discount Code - usually they have promos that will bring down the price of the GC. Then Click Proceed. Step 3: On the left portion, if you will use this GC, click "This is for me". For OFW or for gifting, you may "Add a new recipient to my list". It will ask for details of the recipient. 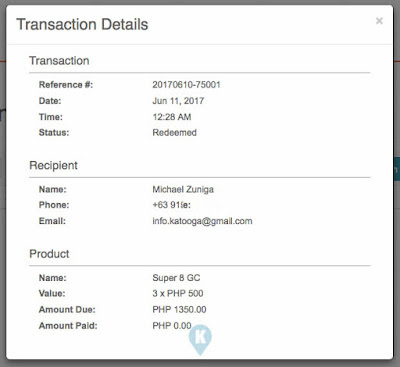 On your right it will already ask for manner of payment via loaded credits. If you have these credits in this account, click the credits portion on the right. If none, simply leave it blank. It will be taken up in the next step. Click on "I agree to the Terms and Conditions" and click proceed. 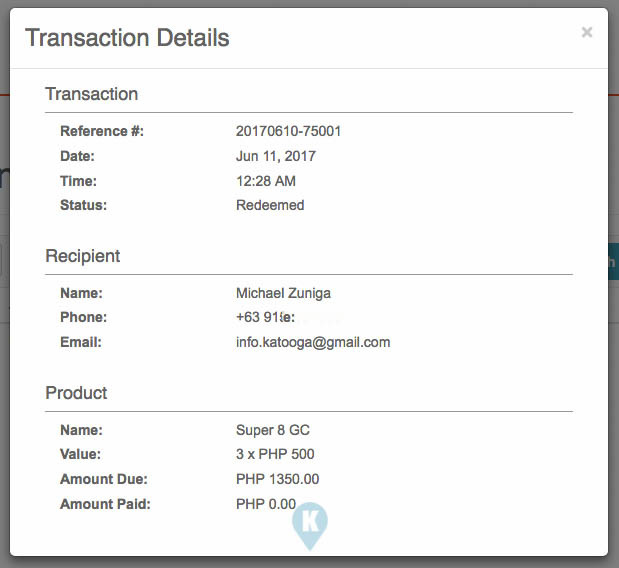 Step 4: This one will ask you how payment of your GC will be made. 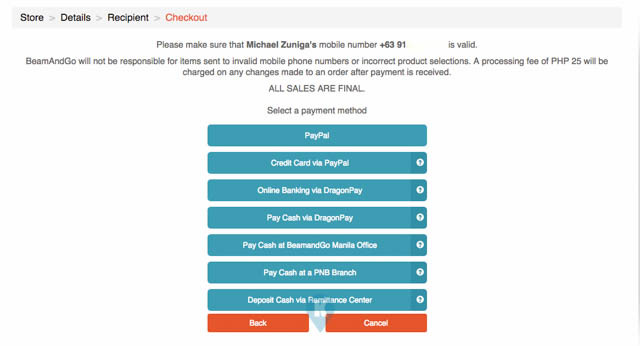 Check on the image below for possible payment options. There's a lot. 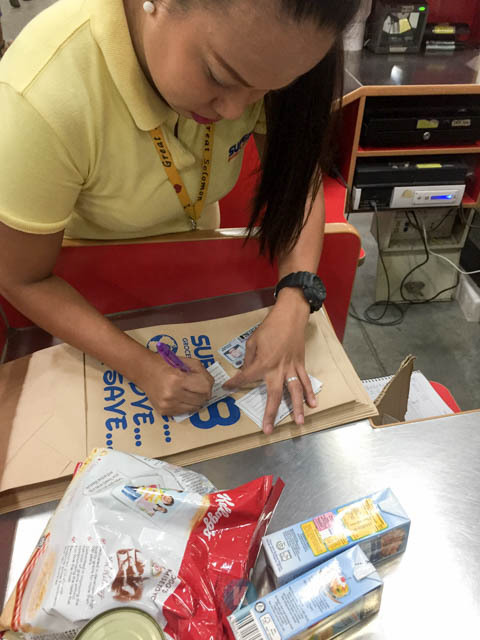 For OFWs, international credit card or bank debit transactions are secured via PayPal. For locals, you can pay or deposit cash in authorized outlets. Step 5: After your purchase, BeamAndGo will confirm your purchase with this window. Also your GC will have their own Serial Numbers or SN. It will be sent to your registered phone number via SMS and Email. 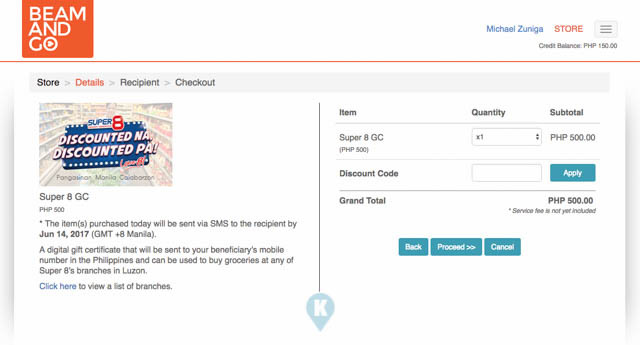 Keep the SMS well as you will use this when you make the actual purchase. If you have other questions refer to this. Now on to the actual purchase of this writer. 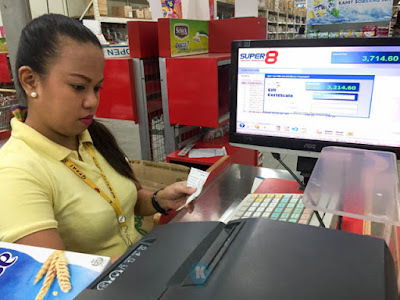 I chose Super8 supermarket as there's one near me in San Pedro, Laguna. I received by GC SN via SMS and here there are. It also instructed me to bring one valid ID as well. 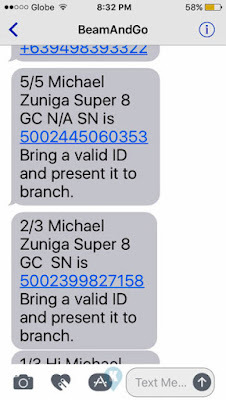 If you are gifting the same, the recipient will received this SMS and same instruction. Armed with the SN. I proceeded to Super 8. 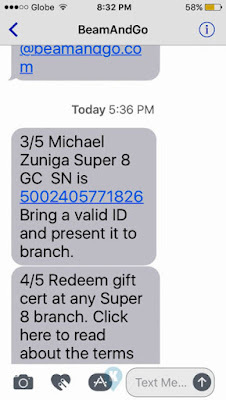 Went to their Customer Service Counter (CSC) and showed them the SMS. They then informed me that I can start my shopping immediately. They also advised me that next time I should shop, no need to go to the Customer Service Counter. They advised me to use an exclusive counter when I check out (Counter 3). After shopping, we found out that Counter 3 was closed. The girl at the CSC immediately called someone and opened Counter 4 for us. Imagine, a closed counter, with no line or queue, was opened up for us. We feel like VIPs. Super8 has a member loyalty program that allots a number of counters due to the huge volume they purchase. For a normal shopper like me, I have to contend with long lines at other counters. With BeamAndGo, we were escorted to an exclusive counter and it was fast. They just filled up bits of pieces of paper, noting down the SN in my SMS. Then they encoded in their POS the same numbers thereby reducing the total amount of my purchase. The balance of course we paid in cash. Overall the experience was more than great. 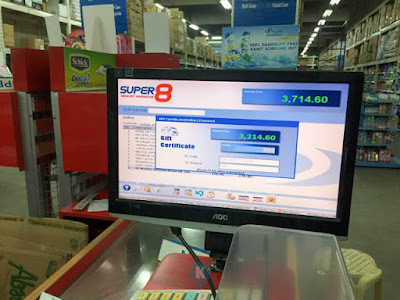 From the convenience of buying GC through BeamAndGo, to the VIP Service provided by Super8, we can say that we really liked the experience. For those who like to gift the GC's, this is a great alternative to purchasing and giving the same. For OFW's, they can be assured that their love ones here in the Philippines will use the GCs for groceries or whatever items in a department store, without worry of the latter bringing lots of cash to the store. Convenient, Shopping Experience and Safety are the main focus of this service. I will definitely use the same in the near future. 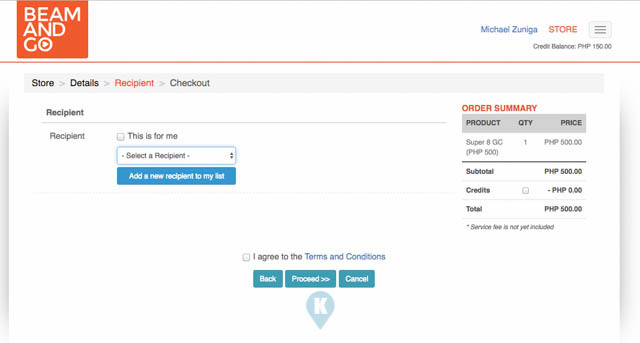 You can see the pictures of the actual purchase done in the succeeding images. The lovely lady at Super8 noted down the serial numbers of our GCs. She then encoded the numbers in their POS. Check out the screen on how they encode the SN in their system. 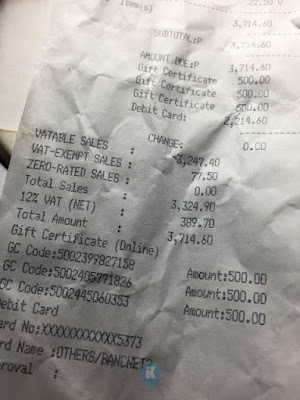 The SN or GC Code is likewise shown in the actual receipt.